The creative director recounts the journey from comics to crowd-funded game. Joe Madureira	CEO/Creative Director, Airship Syndicate Inc.
Hey all, this is Joe Madureira, Creative Director of Airship Syndicate and creator of the Battle Chasers comic series on which Battle Chasers: Nightwar is based. With the beta already in the hands of thousands of our Kickstarter backers, and since we’ve just about made it to the official launch, I thought I’d shed some light on the epic journey that’s gotten us here. Battle Chasers started, in comic form, back in 1998. I had been drawing super hero comics for years, eventually graduating to Marvel’s Uncanny X-Men, which was a dream come true for me, as I had been an avid collector of the series since childhood. It was the #1 selling comic book, and had been for some time. So when I announced after my three year run that I was moving on from Marvel to do my own thing, and that it wouldn’t be another mainstream hero book, but a Steampunk/Fantasy series, there were a few who questioned my sanity, including me (admittedly, it did sound super nichey when I described it out loud). Back then, there wasn’t really anything to compare Battle Chasers to in the states, but in Japan, fantasy and sci-fi were all the rage, in manga (comics), anime, and of course video games. And I was obsessed with the stuff. I would go so far as to play games in Japanese with no translation, and buy import gaming magazines just to drool over the art to games I didn’t even know the titles of. Samurai battling mechs? Gunslingers, trains and airships in a medieval setting? It blew my mind. This stuff seemed to break all the rules of the traditional Tolkien/Dungeons & Dragons fantasy I grew up with (and still love to this day). As I played through ‘JRPGs’ like Lunar, Final Fantasy, Chronotrigger, Suikoden and the like, I couldn’t help but wonder how awesome it would be to create a similar world in comic book form. And so I got to work on Battle Chasers, channeling all that raw inspiration, a little bit of Capcom style, and a dash of the superhero comics I was known for. The formula was a success, and Battle Chasers went on to rival the top mainstream hero books from Marvel and DC. But, the adventures of Gully, Garrison and friends came to a halt after issue #9, when I left comics altogether to pursue a career in the game industry (something that fans never let me forget). As a life-long gamer, I had to seize the opportunity when it presented itself. It was a rocky start, but over the next couple years, I would meet the people that would help bring everything full circle. Together we co-founded Vigil Games and created the Darksiders franchise. Some 7+years later, after Vigil shut its doors, our team largely split up into what would become Gunfire Games (who are hard at work on Darksiders 3) and our little studio, Airship Syndicate. We had no game, no funding, no office (we worked from home, or at coffee shops). Even the name Airship Syndicate didn’t stick until later (after some hilarious name and logo fails). What we did have was a small, dedicated and experienced team, some of us having worked together for nearly 15 years. We decided almost immediately that our first game would be a party based RPG with tactical turn based combat, like the classic JRPG’s of old. 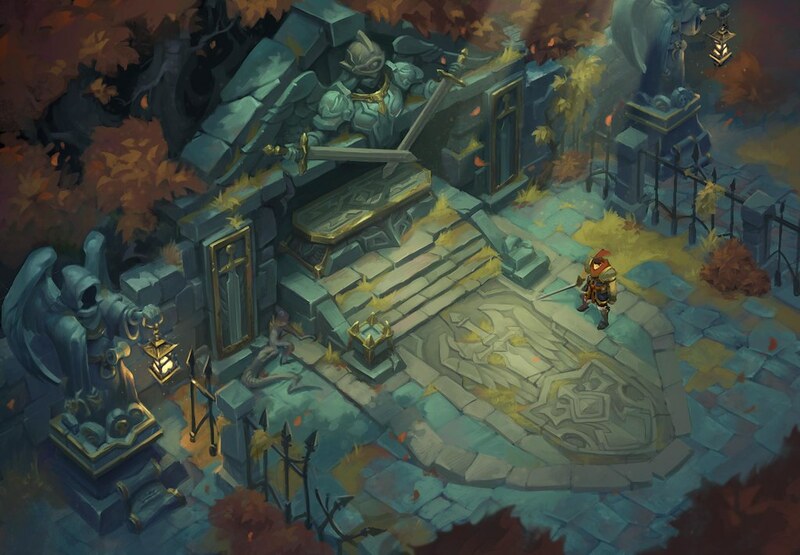 One question kept popping up—“what if this game was set in the Battle Chasers universe?” As the game’s design began to take shape, it all sort of clicked. We really did have a diverse cast of memorable heroes who were themselves influenced by the same RPG’s we were now making. Would fans of the old comic series still care, though? Would it appeal to new gamers that had never heard of the comic? Would investors and publishers dig it? After nearly a year of developing a playable prototype, pitching to publishers and striking out, it became apparent that Kickstarter was our best bet, and possibly our last resort. This campaign would make or break us. Our fans would decide. The next few months were tense. Exciting. Exhilarating even, but so stressful! As you may have guessed, our Kickstarter campaign was a resounding success. We made enough of a splash that we garnered the attention of the gaming press, and publishers that were interested in taking another look. Our friends at THQ Nordic, owners of the Darksiders franchise partnered with us to take the game even further. So here we are, a day away from our official launch, once again waiting with baited breath for the world’s reaction to this game that our team has slaved over for two years. 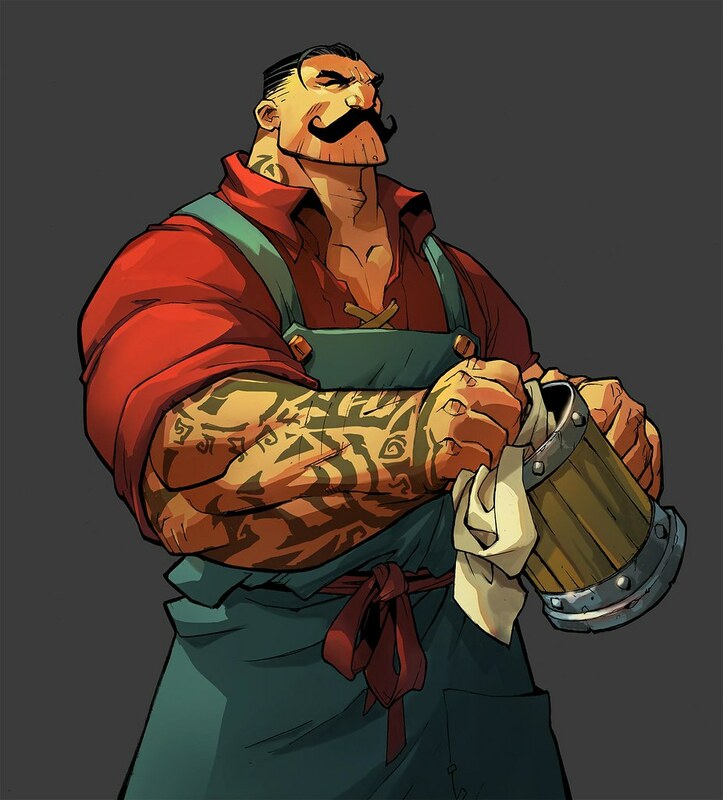 I’d like to use this opportunity to personally thank our longtime fans that beat the Battle Chasers war drums so loudly, they couldn’t be ignored, our amazing backers who in our darkest hour, stormed the field and helped carry us to victory, and of course the stalwart crew of cutthroats and scalawags that are Airship Syndicate, who have devoted their lives to making this game the best it can be. Cheers to you all, and here’s to to the battles ahead! Congratulations on the launch of the game. It looks awesome. Been looking forward to playing it for a while now. Looks really great! Hope there’s a bit more character customization than what I’ve seen. Also a bit of a shame the level of violence portrayed in the animation isn’t there in the game as well. I want to chop off werewolf heads! Oops I’m dumb. Should have done a bit more reading before commenting lol. Didn’t know you were Vigil but the art definitively looks reminiscing. This game looks great and love the art as always. I’ve been looking forward for this game since earlier this year when I stumbled upon it at amazon and took a look. Of all the places Lol. 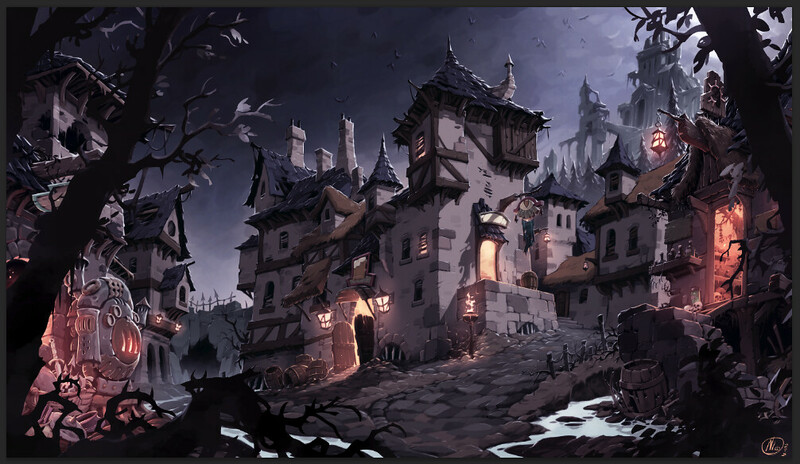 Battle Chasers looks and sound fantastic and I can’t wait to slice it apart whenever I do actually start playing. You can thank SDS for a MLB addiction. Great to see a Kickstarter success and best of luck to you guys! Hope to see more interesting and great games in the future. Yeah I remember this. I still have some of the comics. I remember picking it up in the comic book store because it reminded me of Guardian Heroes and hearing the comic book owner talking to someone else about saying how the main guy looked just like your Wolverine. Hmm I had some of your comics too. This game looks really good! Joe, thanks for the update. Really looking forward to this game!! Ah, the heady days of 1998! 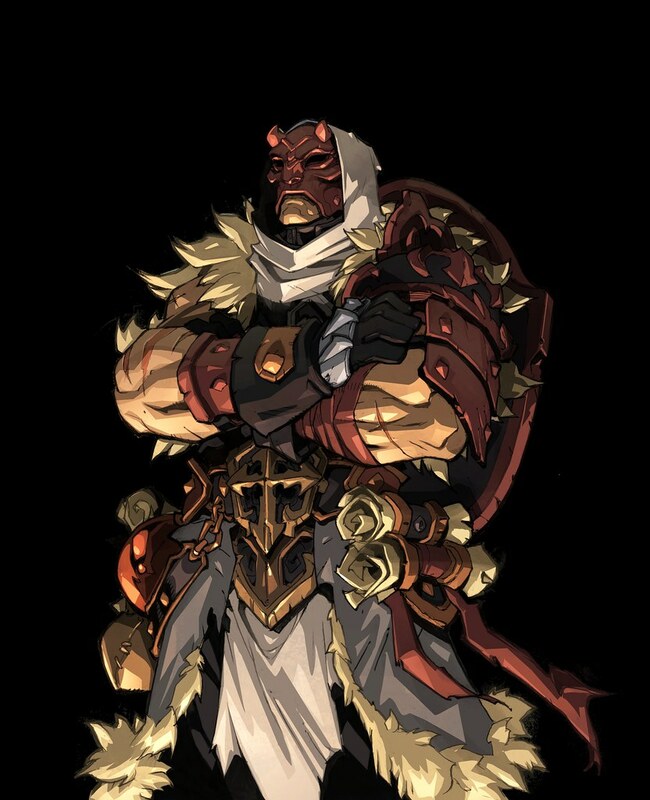 I’m also really looking forward to more Battle Chasers comics! Very interested to see how your art style has changed from the first issues to the new -sans issue ten of course. Thanks so much! Speaking of your first foray into video games, remember Tri-Lunar? I just want to give you and Airship Syndicate my support for getting the IP rights to DragonKind and perhaps fleshing that out, developing it, and of course one day releasing it. I really liked the character designs (of course! ), but it looked and sounded like it had great potential. I think it would be great to add it to Airship Syndicates catalog of IP. I assumed it was going to be an action/rpg of some sort. Either way you could start developing it’s world with smaller games before diving into something bigger. Just thought of something. Airship Syndicate could partner with WayForward to develop a stand alone 16-Bit sidescroller featuring Red Monika, sword and gun gameplay, and their specific brand of super flirty, cute, and beautiful art style! so, this is a JRPG-like game with turn-based combat? i wasn’t sure if that style was your inspiration, but your game’s going to be action-based?? Now if only Sony can figure out a way to accept my money instead of deny all my attempts to buy this game from PSN.